Interested in serving on the CCAC of Montgomery County, MD? There's an opening and you have until July 9 to apply. If you're not familiar with the Cable and Communications Advisory Committee, it advises the County Executive and Council on cable and telecommunications issues. This includes cable TV franchises, PEGs, and maybe even internet thermostats (sigh). If you are selected, your first task can be to get the committee's online records up-to-date. Their records haven't been updated for three months. Here is a link to the current members of the committee. Mmm, perhaps I should say last known members, since that page is likely out-of-date as well. PS: I couldn't get the web page (above) for the PEGs to respond either. It is the correct link though. One more thing for you to look into. Since my earlier post about Pepco's Energy Wise program, many people have emailed me with stories similar to mine. The only difference is that some are even worse. Thermostats not working, even from the front panel. Thermostats making frequent clicking noises. Full manuals for thermostats unavailable. 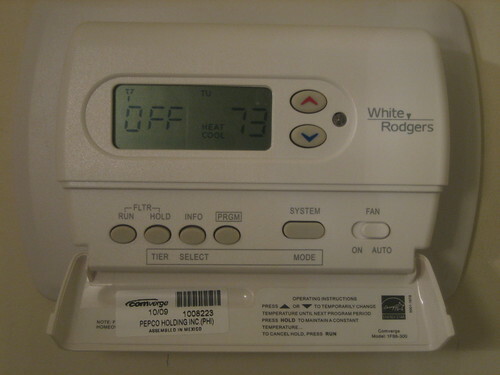 Thermostat needs an additional router port. Comcast GM Craig Snedeker was brought in last year  to fix all the problems in MC MD, yet there is little evidence of him doing so. Complaint levels are higher than ever (3x last year's!) and communication between the county and Comcast appears to be broken, much like the "walled garden" in which Comcast placed my cable modem a few weeks back for no reason at all. Comcast is a powerful company with real strengths. Yet they appear to be throwing it all away. The blame-Verizon strategy isn't working. Comcast had a huge advantage as the de facto monopoly in MC. But if they keep running their system into the ground, it's hard to imagine why customers will continue to put up with their abusive service. I'm not blaming Pepco's problems solely on Craig here. Clearly Pepco has plenty of blame to spread around. Yet no one I spoke to at Pepco seemed to think their behavior was a problem. And although each representative was happy to give me their supervisor's name and number, none of the representatives was willing to take any action personally. I can thank Craig for one thing. He gave me the person at Pepco to whom he reports. He said Avolon Joseph is in charge of the project. A search on the web turned up her title as Manager of Strategic Planning & Initiatives. Me: Can I ask you some questions about Energy Wise program? Avolon: Yes but I'm in a meeting right now. Can I call you right back? If you're expecting more, you'll be disappointed. I waited for the rest of the day. The rest of the week. And the following week. At this point, I feel totally frustrated. I've already filed a complaint with the MD Public Service Commission. No word back from them either. I attached the earlier blog post to it. I'm thinking that I'll attach this one to an additional complaint. In addition, I gave Craig the URL to the blog so he could read it himself. Doubtless he won't be pleased but perhaps he will take some action. As for Avolon: You may choose not to return my calls but you are making for very unhappy customers. And just like any service provider, we will look for all possible ways to avoid dealing with bad ones. I've already switched my electricity generation and transmission services to a competitor. And I encourage others to switch, to file complaints with the MD PSC, and to testify at hearings involving Pepco services. You leave customers no other choice. Faced with close to a billion dollar shortfall (and continuing deficits for years to come), Montgomery County, Maryland is struggling with tax hikes and service cuts. I won't summarize all the cuts and tax hikes but I will mention one that falls in the area of interest to readers of this blog. The county council is considering a resolution to increase the county tax on telephones from $2 to $3. That's per phone - so total up your family's cell phones and your house phone and multiply by 3 to get the amount you'll be paying to MC (Montgomery County). If we're lucky, they won't raise it even higher. Oh, also add MC's 911 tax. That's another .75 per phone. At least, that's what I see on my bill. I threw in the on my bill in the previous sentence because I wouldn't be surprised if you see something different on your bill. Indeed, I don't see the $2 charge on my bill although I do see the 911 charge. And one of my neighbors tells me that his MC 911 charge is $1. Is my phone provider doing the computation incorrectly? Or are the computations just maddeningly complex? I wouldn't be surprised if complexity is an issue. For instance, my phone is VOIP and although I have an MC billing address, the actual phone number doesn't look like an MC number. But I made sure that the 911 service is working so perhaps how MCness is determined depends on which department is doing the determining. Another neighbor of mine notes that she has a 202 (Washington DC) number with a Montgomery County billing address that is assessed the $2 tax so there's yet another explanation needed. Yet another scenario is exhibited with my cell phone. It has a NJ number with a NJ billing address but the phone stays in MC 99% of the time. Although the phone company knows this, I am not assessed the $2 tax. And, of course, I use Skype and other free video services. Needless to say, I don't pay the $2 for Skype. How are we supposed to deal with this morass? More specifically, how can we know which tax computations are correct? How can we predict how this pending resolution may actually affect us if we cannot even understand the current implementation? So back to the original issue. Is MC justified in increasing the tax? The county could have offered a rationale. For instance, regulation costs more than it used to. But that's not what the council staff notes say. And they also don't say that MC collects taxes for telephone service in other ways, such as charging for access to rights of way or charging other business taxes. In fact, no rationale whatsoever is offered. So, in my view, the phone companies and government(s) are doing exactly the same thing (taking advantage of telephone users), albeit in different ways. Or you can do what I did the last time the council raised the phone tax. I switched my service to a jurisdiction with a lower taxes. It is surprising that taxes vary widely between jurisdictions. MC is far from being the lowest. But it is also far from being the highest. I mentioned earlier having a NJ cell phone. That was a no brainer - since I have some relatives in NJ, I simply asked if I could piggyback on their family plan. I checked with Verizon Wireless as well and they had no problem with the phone being out of the area. I ultimately reduced my payments to Verizon significantly and my payments to MC went to zero. Having an out-of-state area code doesn't seem to be the problem that it might have been a decade ago. Now, most people have plans where interstate calls cost the same as local calls. So for the phone on my family plan, I pay $12.99 for wireless access. That includes all taxes and fees. I also transferred my landline to VOIP. This also reduced my payments to MC and my payments to Verizon went to zero. For VOIP, I pay $18.07. That includes all taxes and fees. If you do write that letter to the council, mention that higher taxes will be counterproductive - and that you intend to transfer your phone service to a jurisdiction with lower telephone taxes. The county predicts they're going to reap a windfall of $11.85 million from higher taxes. But they're going to have to do it without us.